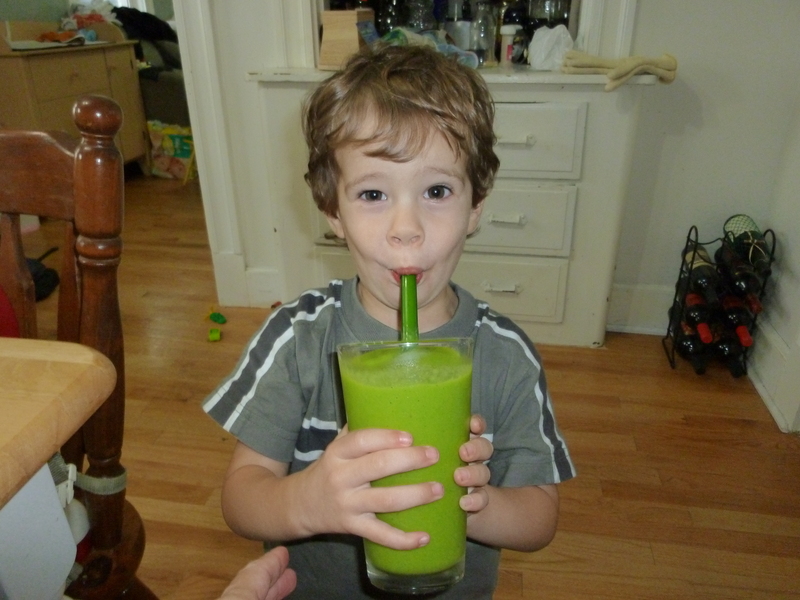 Many readers have asked me about our daily smoothies, especially our green ones! 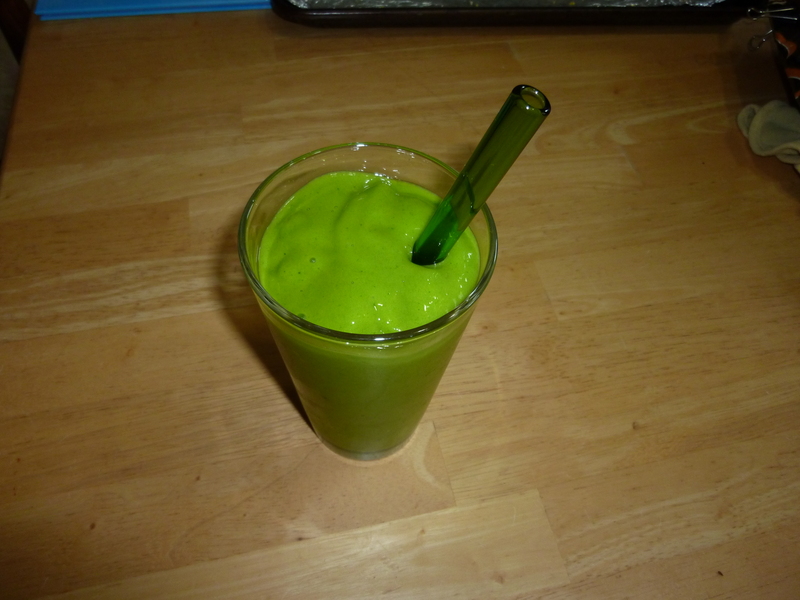 While I have sometimes linked to an older green smoothie recipe I decided a new and more complete one was in order. Below is my preferred green smoothie recipe. Of course, it can totally be adapted! It is fun to try different fruits or non-dairy milks, but try and keep the ratios the same for a good thick smoothie consistency. It is also important to note we have a Vitamix blender. When we first bought it a few years ago I couldn’t believe we were spending that much money on a blender. However, it has turned out to be one of the best investments for our kitchen! We use it daily for smoothies, and we also use if for soups, tahini, chocolate mousse, ice cream and other delectable treats! If you have a regular blender you might need to add more more liquid to get the smoothie fully blended, but it will still be delicious! 2 cups of chopped, frozen greens (see note below). Kale is by far my favorite type of green to use in a smoothie, but I have also used spinach, and, more recently, collards and they have both worked well If you find your smoothie tastes a bit too “green” or “grassy” just decrease the amount of greens and/or increase the amount of juice and/or fruit. 1) Put the ingredients in the blender in the order listed. Putting the frozen fruit on top of the greens helps the greens get mixed in. Blend until it is a consistency to your liking! You may need to pause the blender and break up the frozen fruit a bit, or add some more liquid to get it going. Note: We like to wash, chop and freeze greens for smoothies ahead of time. When we buy greens (or pick them from our garden) we tear the leaves off the stems and then rough chop the leaves. Then we put the leaves in a colander and wash them thoroughly. Finally, dry them off (in a salad spinner or with a towel), put them in a ziploc bag and then put them in the freezer. 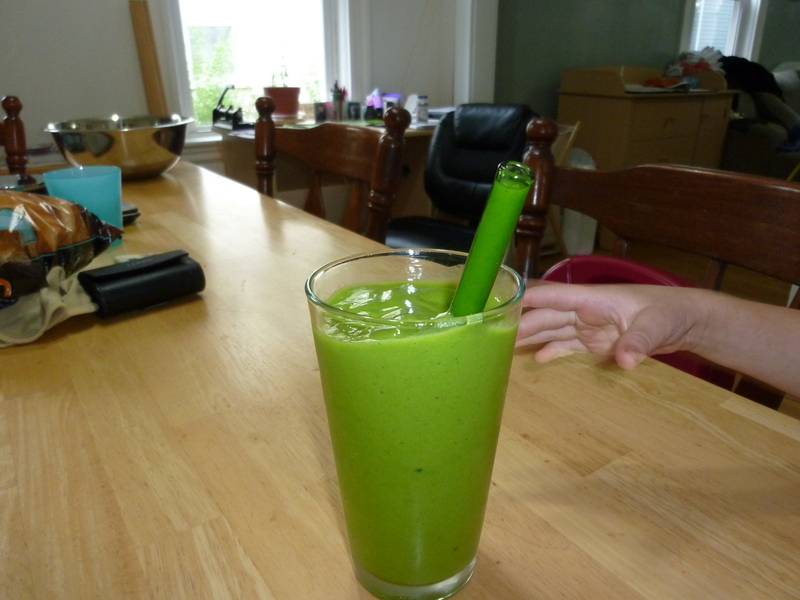 The stems go into our compost bin and then we have ready-made smoothie greens in the freezer! LP can’t wait to get his hands on it! Breakfast: Green smoothies and oatmeal for Dad and LP and cream of wheat with raisins for Mom. Mom and LP shared a chocolate chip scone from Whole Foods as a special “treat” during our morning outing to the store. Poor Dad didn’t get any – Mom and LP devoured it too fast! More grapes and pita bread for LP’s snack! While LP napped Mom and Dad also had some chocolate bread. Dinner: Udon noodle stir fry with bok choy, cabbage and tofu. The tofu was definitely a hit with LP! In terms of the coconut, one of the thing we learned about when we had LP was how to add healthy fats to our diet (something I had not really thought about before since I pretty much was trying to eliminate fat when I was trying to get pregnant). It turns out the saturated fat in coconut is “medium chain” fat (or medium chain fatty acid), which the body responds to differently than “long chain” fats (the other kind of saturated fats). Medium chain fats are easier to metabolize which means that your body will use them for energy rather than store them (unless you just sit around all day, I assume). LP has plenty of energy, as do most kids, so they are burning this fat pretty darn fast! Medium chain fatty acids also have some health benefits, such as having a positive effect on immunity. (All this information comes from “The 150 Healthiest Foods on Earth” by Jonny Bowden). That being said, avocado would be a great addition! I imagine it would make a super smooth and creamy smoothie too!! One reason I probably won’t be adding it to our regular smoothie is because avocados are pretty expensive out east (especially to a CA transplant, as I’m sure you understand!) When we buy avocados, LP loves to eat them plain – we will sometimes just give him a spoon and half an avocado and let him go at it. Since he likes that so much, I figure we might as well save them for that. However, I might need to try it just once to see how it turns out – totally great idea! Wow, thanks for that great answer! I suddenly had this awkward feeling of deja vu, where you may have once before given me the short answer to this same question. Really appreciate the cell bio answer. I wonder if adult “good fats” and kid “good fats” are different. Hah, I too am exactly like that with avocados. They never make it as far as a recipe. Sweet potatoes as well, though I was thinking of juicing some and adding them to the smoothie for some creaminess. Ohhhh, sweet potatoes. I just roast them (or sometimes just bake them and then top them with a little maple syrup!) Sooo yummy! I never thought about it, but it would make sense that good fats for kids and adults are different. Kids are growing so fast and are so darn active, they must be able to use a different combination that someone like me. Interesting! Also, I don’t think I’ve said this to you before – it was one of those things I knew I had “heard” before, but couldn’t exactly remember (hence the fact that I had to look it up). I feel like it is one of those little factoids I read in blogs or hear about on NPR every once in a while.